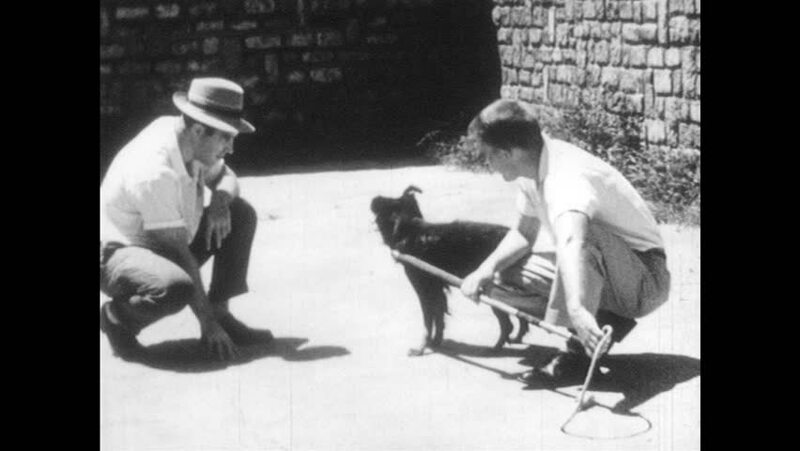 1950s: Two men squat on pavement and interact with small black dog, one man has it retrained with pole and lead. Small black one looks around. Small white one on lead walks. It looks sick. hd00:121960s: In slow-motion, players lunge into tackle on wooden frame impact equipment as coach stands on wood and players move the frame down field. 4k00:211940s: People in native dress, grass skirts, flower garlands, dance, shake hips, wave hands. People stand, watch. 4k00:221940s: People in native dress, grass skirts, flower garlands, dance, advance forward, shake hips, wave hands, man holds oar, leads group. hd00:311960s: Men hand piece of deer meet to young child, who eats it. Group of people dance in a semicircle. 4k00:211940s: Palm trees, people in native dress, grass skirts, dance, wave hands, shake hips. Men dance with sticks. Man carries bundle of sticks, hits ground with axe. 4k00:161930s: Two boys throw rocks in a mountain stream.